It doesn't matter how long you farm, it's still sad when you lose a lamb. Late last night we had one that was very weak. 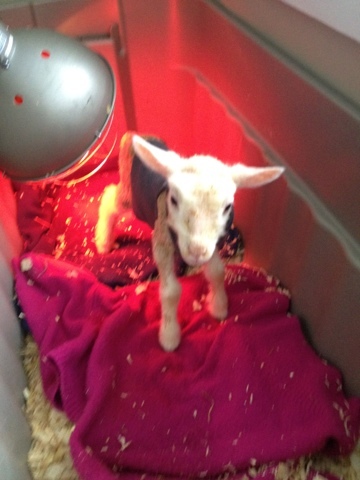 So I bought her up to the house and she became a kitchen lamb. I set to work with a blow dryer in oder to gently warm her. She was covered in meconium, so it was a sticky messy job to get her dry. I knew she would make it when at one point she lifted her head to look at me - she was doing her best to come around. I then managed to get several syringes of colostrum into her, she readily sucked at the syringe by the last one. Then it was into the warming box. For the rest of the night I fed her and checked on her. By morning, I was greeted with a wagging tail and a smiling face.